The newest Point-based Auction website in the Philippines is BiliBid.com ; No not the one for rehab but "Bili Bid" translates to "Buy Bid". Bilibid.com started out as "Refreshed Idea" of its Innovators at my age bracket when one time they are in Starbucks for coffee. So that started their venture with the right resources and time. 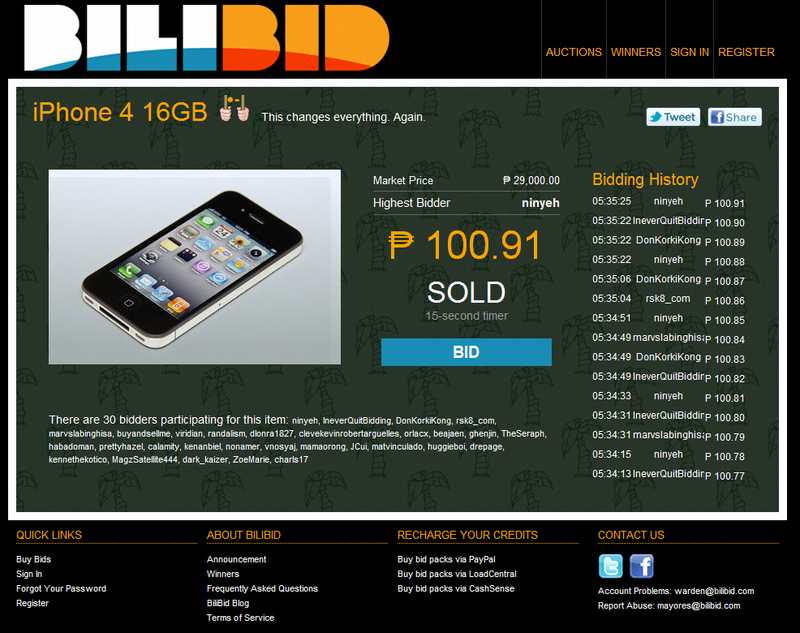 BiliBid is a penny auction website wherein users can bid for a specific item using bid points. Following the usual bidding process, whoever bids the highest price for the item, wins the auction. BiliBid gives an amazing opportunity to Filipino consumers to purchase items on lowest prices. 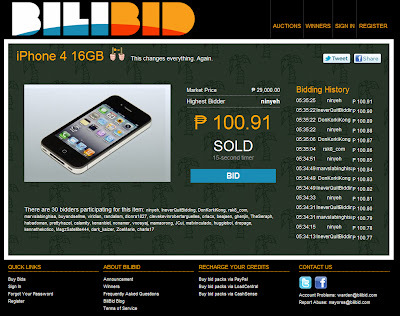 Apple iOS iPhone 4 sold to one of Bilibid.com bidders. • What are bid points? - Bid points are credits used to participate in an auction at BiliBid. It can be purchased from their accredited sellers. • Where can I get bid points? • How to join BiliBid? - You need to register for a BiliBid account and you have to confirm your registration using your email you used upon registration. You are now good to go in bidding as long as you have bid points on your account. • What is a countdown timer? - Countdown timer is the last number of seconds for the auction to end. The crucial part of the auction since this is the moment wherein bidders will eagerly place bids to prevent others from winning the auction item. An 8-second countdown timer means that if someone places a bid on the item on the last 8 seconds of the auction, the timer will reset back to 8 seconds. • How do I claim the item I won? - Auction winners will be contacted by BiliBid using the email address and/or mobile phone you provided upon registration. They need to verify basic information like name, address, contact number, etc. Send them a digital copy (scanned copy, cellphone photo) of your valid ID. The information on the ID must match the personal information (name, gender, birthday) your provided on your profile. • How do I top up the bid pack I purchased? - Using Card Number and Card PIN you've purchased, go to "Redeem PIN" to be credited with bidding points. A message will display stating that your top up is successful. 0 comments: on "BiliBID.com is the newest Local Auction website for Filipinos"